After a bumpy ride for crude oil prices in 2014, investors should continue to expect the unexpected in 2015. After relative stability for the past few years, crude oil prices took us on an unexpected downhill ride in 2014 as the price of global crude oil benchmark Brent hit the skids in late summer and came tumbling down. That chart wasn't what anyone forecasted for 2014 as everyone from the U.S. Energy Information Agency to Wall Street analysts pegged $105 as the average price for Brent crude oil. That was thought to be a safe bet as analysts across the globe firmly believed that oil prices wouldn't break below $100 as there was a general consensus was OPEC would never let that happen. It turns out that OPEC doesn't care what the general consensus is these days as it has a new rival that needs to be stomped out. Because of that, those views of $100 oil have gone out the window as we enter 2015. The current outlook for Brent crude oil is that prices will average just over $83 per barrel over the next year according to the EIA. However, there are differing opinions as analysts from HSBC, for example, see Brent staying around $90 per barrel for most of the year before ending the year closer to $95 per barrel. That's quite a bullish forecast, which clashes with other predictions like those of the International Energy Agency, for example, which sees Brent below $80 per barrel in 2015. 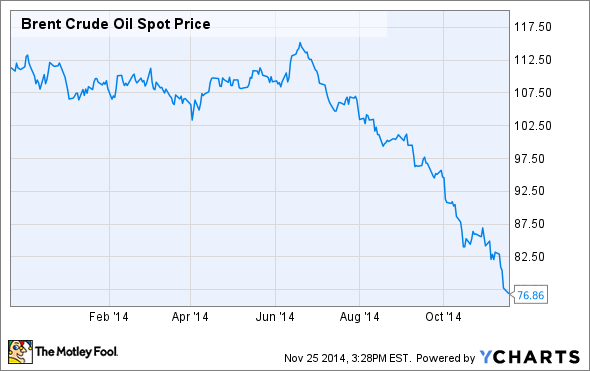 Needless to say, 2015 is shaping up to be a very interesting year for oil prices. Tyler Crowe: I don't want to say that oil prices will go down, because the second I write it there will probably be some major event that sends prices skyrocketing again. Based on where oil prices are today and what factors are influencing it, though, here is the major factor that could keep it lower than what people are predicting: the oil market isn't that fast to react. It's pretty clear now that there is a disturbance in the force ... of supply and demand (I had to do it, the new Star Wars trailer just came out). OPEC has said it doesn't want to cut production, U.S. shale producers keep saying they are totally cool with today's prices and won't significantly slow down their shale drilling program, and there aren't any clear signs that either China's or Europe's economies -- and by default, their thirst for oil -- will be getting any better fast. Long term, of course these factors will change. A simple OPEC announcement that it will cut production, some signs of life from some of these struggling economies, or the weeding out of some shale oil producers that rely on high oil prices to make the economics work could all eventually lead to a rise in prices from today. However, we're only talking about 2015 here, and it's hard to see these three factors changing significantly in that time frame. Matt DiLallo: I'm with Tyler on wanting to shy away from a particular view on crude oil prices for 2015. Instead, I want to take a look at two factors that could push crude oil prices higher than the current mid-$80 forecast that most others have for 2015. Either factor has the potential to correct the disturbance in the economics forces of supply and demand. First, we now have OPEC as a real wild card in 2015. It says that it is cool with lower oil prices, but not all members are fully on board with the decision. Countries like Venezuela and Nigeria are really hurting at lower oil prices and might not be able to take too much more pain. If their cries grow too loud then its quite possible that OPEC will acquiesce and cut production dramatically in order to boost prices. The other factor here is demand for oil, which hasn't been all that great over the past few years. However, lower oil prices could very well be the fuel needed to spur new demand for oil. It is estimated that a drop in oil prices from $100 to $80 per barrel would, over the course of a year, be akin to a trillion dollar economic stimulus for the global economy. That's a massive stimulus that could be the shot in the arm the economy needs. Once the economy starts to meaningfully improve, its quite possible that crude oil prices improve just as quickly as they plunged earlier in 2014. We all know that oil prices are a temperamental thing. We're a rebellion in a major oil producing nation away from a severe shortage, or a bad economic report from China or the U.S. away from another major price slide. That's why both of us are so skeptical of actually making a definitive case for why oil will move one way or the other, and it's just plain dumb for investors to try to invest based on price movements. That doesn't mean oil prices are completely useless to investors, though. Some valuable investing lessons can be learned from big swings in oil prices. For example, cheap oil will really let us know which oil and gas producers in the U.S. are best suited to handle the tough times. Another important lesson is that an investing thesis shouldn't be built upon OPEC, or any other outside factor, acting in the way we'd expect it to act. Instead, we should focus on knowing how the market reacts to these kinds of major changes as it will help prepare us for the next time it happens. If only we could remember them.